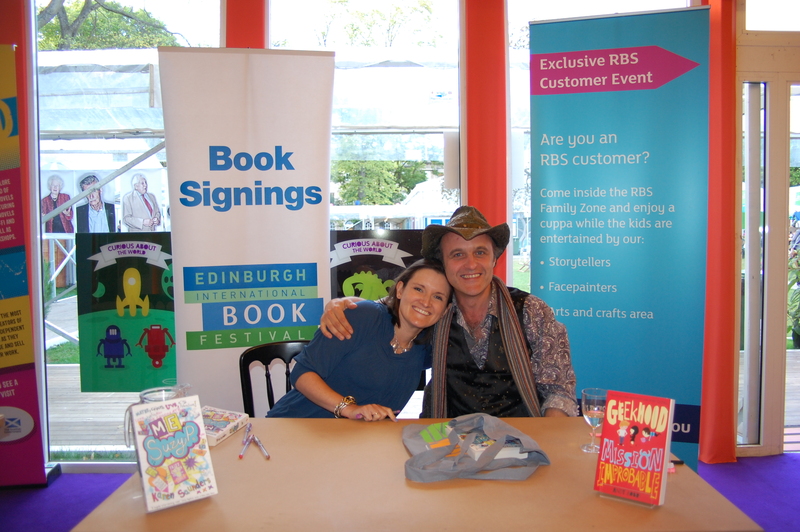 All About the Edinburgh Literature Festival! 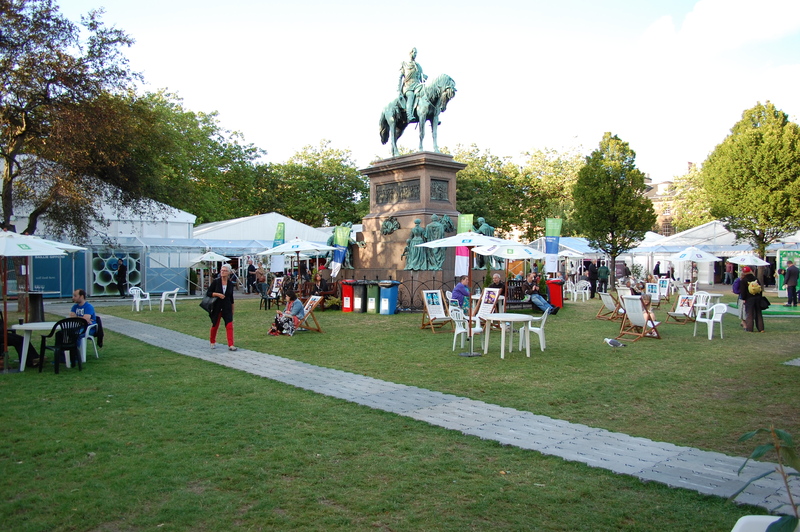 The Edinburgh Book Festival is a pretty big deal. So when they invited me to attend, I was SUPER excited. It’s the EDINBURGH FESTIVAL, people! Now all I had to do was ignore the niggle of fear I get whenever I think about speaking in front of an audience. So I stuck my head firmly in the sand and focused on the exciting stuff. My excitement grew as I talked to authory friends who told me things about the festival. There would be a lanyard, with my name on! (I was more excited about this than anything else. Sad, but true). 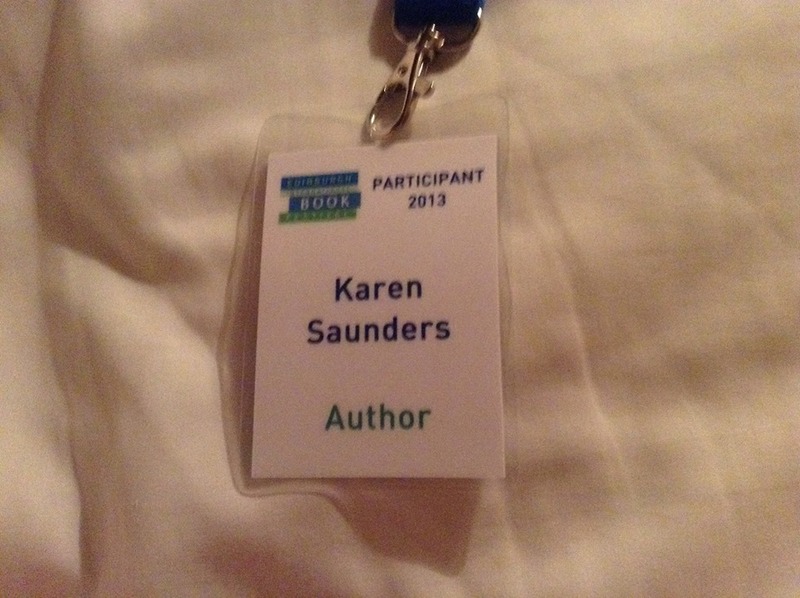 And this lanyard would allow me access into that most hallowed of all places, the author’s yurt, which would be filled to bursting with incredibly famous people. Eeps! Amazing! My excitement grew further still when my amazing mother-in-law agreed to look after my son for the weekend, meaning my husband could come along with me, and act as my Official Entourage during the festival weekend. The hotel was booked. The train tickets were booked. The childcare was booked. What could possibly go wrong? 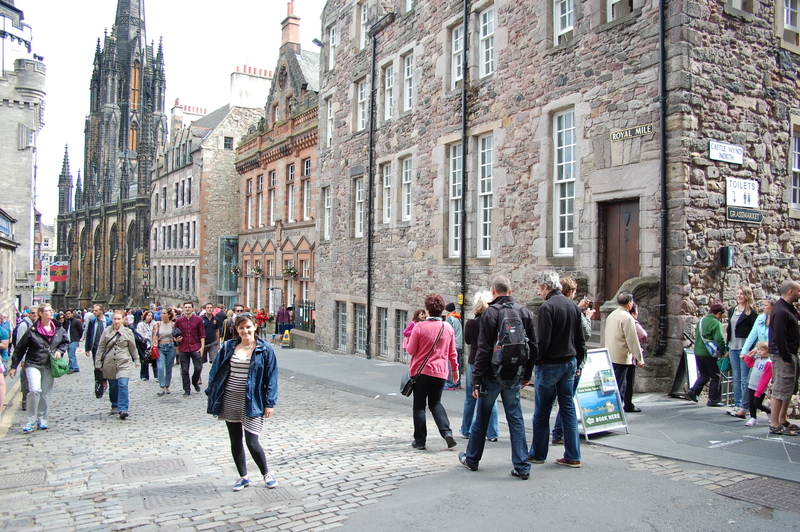 A pre-event mooch up the Royal Mile. Nice mac. Weeeeellll….unfortunately my son is just as much of a disaster zone as I am, and the evening before we were due to get a train to THE OTHER END OF THE COUNTRY decided it was the perfect time to fall and cut his head open, requiring a panicked trip to A&E and many, many stitches. My nerves were in pieces! (There really was an awful lot of blood). Luckily he was fine, and we were able to leave the next day, if a little later than planned, and slightly more on edge than ideal. One very long train journey later, we arrived in Edinburgh. It’s an amazing place to visit at the best of times, but festival time it’s something else, it’s buzzing with life and there’s loads going on wherever you look. On the way to our hotel we spotted Julia Donaldson and her husband, touting his gee-tar. Yay! Famous people! A good night’s sleep in the lovely hotel and a mooch around town later, it was time for the scary stuff. The event! Yikes! I was doing the event with Andy Robb (to be clear, he was not a scary thing), author of Geekhood: Close Encounters of the Girl Kind and Geekhood: Mission Improbable . If you haven’t read his books, you should, they are very, very funny. Even if my husband had to explain the LOTR references to me (it was almost friendship terminated immediately when I confessed to Andy I hadn’t read the books OR seen the films). Andy and I had talked on the phone beforehand, so I knew he was a nice guy, but we got on like a house on fire when we met official, like (in the yurt! But no famous people were there). We were gabbing away non-stop, and trying to out-do each other with who was the more nervous (official placings: a draw). Then Julia Eccleshare arrived, who was chairing our event. Julia is a Very Important Person at the Guardian, and what she doesn’t know about children’s books can be written on a postage stamp. She was very reassuring, and made us both feel a lot better about it all. And then it was time! We were miked up, and ushered off to our tent and to meet our public, dahling. On stage, doing our embarrassing thang. And the event was actually lots of fun. Andy is definitely the ying to my yang. 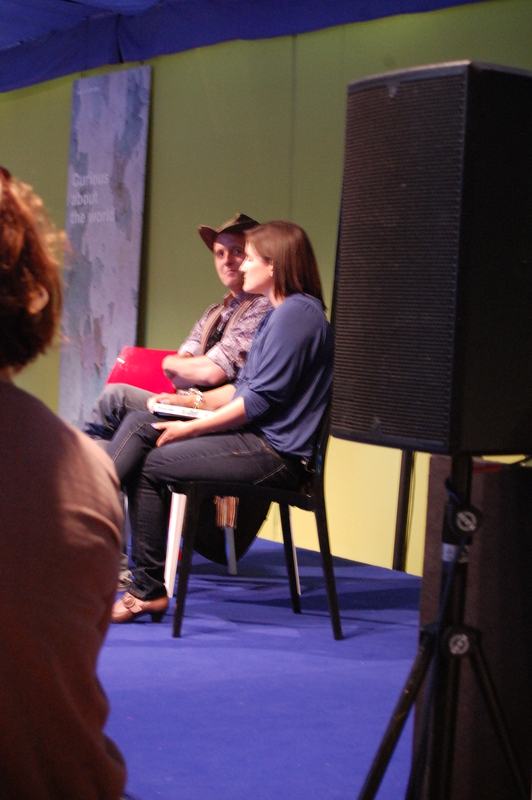 I do not move around during events – for the very real reason there’s every chance I’ll fall over – whereas Andy bounces around all over the place like Tigger, telling animated stories and sitting next to audience members. We were asked questions, answered questions, discussed embarrassment and embarrassing times, and generally had a lovely time. In the blink of an eye it was over, and we were ushered to the book tent to do our book signing. Here I met lots of audience members, including Sister Spooky, blogger extraordinaire, who I’d chatted with on Twitter. It was great to meet her in person, and also met Laura, the publicity manager from Templar, my publisher. I’m not sure I made any sense at all post-event, I was a gibbering wreck with far too much adrenaline in my system. We all went back to the yurt after, and there was STILL a disappointing lack of famous people there. Ho hum. On my way out, I signed the guest book, and, genius that I am, managed to spell Edinburgh wrong. Will be adding that to my list of most embarrassing moments, then. The next day saw us eat a huge brunch and have a fab catch up with my lovely lovely agent Lindsey Fraser, before getting the train home. Andy and me. If you’ve ever wondered what post-event relief looks like, now you know. Using my standard ‘Was this event a success checklist’ – did I die? Vomit? Fall over? The answer to all three has to be no, so all in all, Edinburgh has been judged A SUCCESS! Thanks so much for having me, Edinburgh Fest Peeps. I had a blast.